We’d love your help. Let us know what’s wrong with this preview of De parade by Dave Eggers. To ask other readers questions about De parade, please sign up. What is the authentic measure of a human being: his commitments to an important goal; or his responses to unforeseen circumstances? Commitments are professional; responses are personal. Commitments are often contractual; responses are usually not obligatory, especially when they may require criminality as well as ingenuity. The question becomes even more intriguing when the people involved do not know each other, not even by name. And when both commitments and ad hoc responses are contained, as it were, in some larger system of commitments and responses whose real purpose is unknown. Is it even possible to speak of moral responsibility of any sort in such circumstances? The Parade is a variation on the stylistic devices of Kafka’s Castle, Buzzati’s The Tartare Steppe and Coetzee’s Waiting for the Barbarians. No one has a name, only a designation. The location is threatening but not overtly violent. The reader is permanently stuck in medias res, waiting for the resolution of a mystery which hasn’t been stated. Motivations are unclear except for the notions of duty and personal affection. The distinguishing feature of The Parade is that its protagonists, a two-man road-paving crew, penetrate into an alien landscape rather than preparing for the approach of what the landscape might have in store for them. Four had never met this man, and did not think himself capable of prophecy, but in a instant he knew Nine was an agent of chaos and would make the difficult work ahead far more so. Lasting impressions will be the health aide worker who doesn't want to stop watching television when someone in need knocks on the clinic door, Four's soundtrack, and that perfect black road. Straight and gleaming with immaculate white stripes through all that human tragedy. Lori Joseph wrote: "Interesting review, Lori. Thank you." Joseph Sciuto Lori wrote: "Joseph wrote: "Interesting review, Lori. Thank you." two men - named Four and Nine (security company pseudonyms), are on a 12-day assignment to repair a road before a planned parade by the President, “ known for political theater. Both of these men were anonymous and of little value... other than do their job. Four dishes out the important tasks. He’s the boss! Serious - responsible - most experienced.... sixty three different assignments in all. Four could be counted on to complete any job on time or early. He didn’t earn the nickname, ‘clock’ for no reason. and frankly, Four considered Nine a liability. Nine is a character- but Four doesn’t consider anything about him funny - not his hair that impedes his vision...pushing it out of the way a hundred times a day - nor his feminine mouth. Dave Eggers prose touched me right in my gut! Two (probably American) contractors have to pave a new road across the blighted, war-torn landscape of a Third World shithole (probably in Africa) so the new regime can have a parade on it. A novel about road paving. And it’s as exciting to read as it sounds! I like Dave Eggers but his books set in Africa/the Middle East are, for whatever reason, turrible. I hoped Eggers would take the mundane setup and do something interesting with it - no way could the book be so determinedly dull - but, nope, Two (probably American) contractors have to pave a new road across the blighted, war-torn landscape of a Third World shithole (probably in Africa) so the new regime can have a parade on it. A novel about road paving. And it’s as exciting to read as it sounds! I still tried to see what Eggers was trying to say - if anything. The two contractors are Four and Nine (for security reasons they don’t know each other’s real names): Four is stoic and professional who puts his head down and gets on with the job; Nine is reckless and irresponsible, shirking his duties and nearly getting killed. Was this a metaphor for life - the road being paved is life and you can choose to walk along it not taking risks like Four but ultimately have an uneventful time of it, or you can be like Nine and take risks and have adventures, living it up while you can? Probably not - that’d be too banal, even for a self-consciously literary novel. But then I don’t know what the point of the novel was! And that nihilistic ending - is Eggers saying that the Third World can’t be helped until they help themselves? From what I know of the chap, it seems unlikely Eggers would be that uncharitable. Parts of the story were mildly interesting like when Nine got sick and Four had to figure out a way to save him. The character of Medallion kept me guessing as to whether he’d turn on the two men at some point or not. Eggers’ writing too is decent - clearly composed if uninspired - and I felt a strong sense of place from the descriptions. "Don't you see? It's like a parade before the real parade. This is one of hope. A procession of longing." Dave Eggers sets the wheels turning in this one. He sets his storyline within the margins of an unnamed country ravaged by war for over ten years. Peace is a construct served up by the government under questionable circumstances. A road is to be laid out connecting the north to the south for the first time in forever. A parade of celebration will be take place after completion. Eggers never qu "Don't you see? It's like a parade before the real parade. This is one of hope. A procession of longing." Eggers never quite labels anything in this newest offering. We assume that the said country may, indeed, be in Africa with two men from Western countries set to pave the road. Their private names and that of their particular countries and company are sealed as well. Four is built with a mechanical mindset almost as rigid as the RS-80 itself. He's a "solely by the book" kind of guy who adheres to company policy like a steel vice. Four has a low threshold when it comes to tolerance. We know nothing of his background story or his life before taking on this position. From the onset we realize that he and Nine are going to be like a dull razor tearing at a raggedy beard. Nine is filled with life and curiosity. We've got a sort of Grasshopper and the Ant scenario happening. Nine takes off for hours at a time in search of adventures in the passing villages. Four obsesses with vengeance against Nine as he continues his job of paving hour after hour. His daily rituals remain the same even under these circumstances. Nine seems to always show up eventually ........until he goes missing. And here is where our story escalates. What are we to make of his slight new novel, “The Parade,” a tale of Western assistance in the developing world? The story opens in an unnamed country that has recently emerged from civil war. To reunify this broken land, an international company has been hired to build a highway connecting the rural south to the urban north. In two weeks, when the work is done, the president will hold a parade to demonstrate his nation’s new era of peace and prosperity. All that remains is to pave and paint this What are we to make of his slight new novel, “The Parade,” a tale of Western assistance in the developing world? For security reasons, the two men entrusted with this work don’t give their names, identifying themselves only by numbers. The driver of the giant paving machine is “Four,” an experienced construction worker who holds strictly to every company policy, particularly the rule prohibiting interaction with the local populace. Much to Four’s consternation, his partner, “Nine,” is a cavalier novice who constantly wanders away to frolic with the people they pass. Four deplores everything about his younger partner, from his ridiculously long hair to his disregard for the dangers of their job. But Nine has such a buoyant spirit and such an appreciation for this place and these native people that he makes Four seem. . . .
Four just wanted to do his job. He operated a state-of-the-art paver and he had a schedule to meet. He was to pave a road that would connect two halves of a country, the rebels at one end and the modern city and army at the other end. He was to keep to himself, not get involved, just do his duty and go home. Nine had other ideas. He was to ride ahead and remove anything that might hinder Four's advancement. But Nine was a free spirit. He chatted up the locals, ate at their fires and went to bed Four just wanted to do his job. He operated a state-of-the-art paver and he had a schedule to meet. He was to pave a road that would connect two halves of a country, the rebels at one end and the modern city and army at the other end. He was to keep to himself, not get involved, just do his duty and go home. Nine had other ideas. He was to ride ahead and remove anything that might hinder Four's advancement. But Nine was a free spirit. He chatted up the locals, ate at their fires and went to bed with their women. He made connections. Four couldn't control Nine. If he reported Nine's misadventures it would make Four look bad. Nine's behavior brought a crisis when he came down deathly ill, forcing Four to accept the help of locals to save his life. This short novel is an extended parable. What interests me is that the title is not 'The Road' or a reference to Four and Nine's divergent attitudes towards the people they met who have endured war but still offer hospitality. No, it is called The Parade. Four's time schedule must be met because there is a parade scheduled by the general in the city at the other end of the road. The road's completion is to be celebrated. Four completely believes in the road's peaceable purpose of bringing progress to the rural bush folk. He has bought the story of the celebration. The twisted, dark ending was almost expected. In some ways, Four's faith in his supposed peaceful purpose recalled to mind another novel I recently read, The Cassandra by Sharma Shields, in which a young woman finds work at a government facility working on something that will end WWII. She completely buys into her work and purpose until she discovers what it is that will end the war--the Atom Bomb. I have always wondered how people can participate in industries that manufacture products of destruction. How do they justify their work? Do they willingly believe some fantasy? Do they push the purpose out of their minds? How hard it must be to discover too late what you have done. It is easier to believe in a fantasy parade. This was a pretty sharp and satirical short story about contract work in developing countries. I appreciate Eggers and enjoy his tone and manages to say unexpected and profound things. The premise is simple enough: a pair of western contractors have been sent to an unnamed country that has been ravaged by years of civil war. In this time of peace, they have been contracted to pave a road bridging the northern and southern regions of this country. The story is narrated by Four, the older and more experienced of the two men. Four intends to carry out this job has he has every assignment before, but Nine throws a wrench in that. As Four keeps his head down and his gaze fixed on t The premise is simple enough: a pair of western contractors have been sent to an unnamed country that has been ravaged by years of civil war. In this time of peace, they have been contracted to pave a road bridging the northern and southern regions of this country. The story is narrated by Four, the older and more experienced of the two men. Four intends to carry out this job has he has every assignment before, but Nine throws a wrench in that. As Four keeps his head down and his gaze fixed on the finish line, Nine soaks up the landscape and the hospitality of locals. The Parade chugs along at a steady pace. I wouldn't characterize this as particularly suspenseful, but the book doesn't drag on. Eggers leads you on with the promise of further intrigue and maybe, just maybe figuring out what this book is actually about. It feels almost allegorical with the way he layers on the vagueness: an unnamed company sending two men who go only by pseudonyms to an unnamed country after a conflict between nameless factions. It felt at times as if I knew the machine they were using to pave the road better than the characters before me. I enjoyed how both Four and Nine's relationship evolved over time, but the ending ultimately fell flat. The final twist was tragically predictable and didn't land with much more than a thud. For better or for worse, I've never read anything quite like The Parade before. Grunbergiaans, satirisch boek over hulpverlening en bureaucratie. Het sterke aan Eggers’ werk is zijn bevlogenheid, zijn onvermoeibare journalistieke insteek. Eggers is nergens zeurderig, wel schrijnend en boven alles is De Parade een bijna klassieke, Orwelliaanse vertelling met meer lagen dan je zou vermoeden. Zijn boeken gaan altijd over mensen die verzuipen maar ergens een reddingsboei proberen te vinden. Laat dat voor de mens de literatuur zijn. My actual rating is 4.5 for this masterful piece of storytelling by Dave Eggers. There is not a wasted word in this short account of two men who have been charged with building a road to unify an unknown country that has been ravaged by 10 years of civil war. Conflict on all levels - personal, interpersonal, and societal - is a central theme. The resolution of these conflicts makes for compelling reading and creates an underlying current of stress throughout the book. I have been unable to let g My actual rating is 4.5 for this masterful piece of storytelling by Dave Eggers. There is not a wasted word in this short account of two men who have been charged with building a road to unify an unknown country that has been ravaged by 10 years of civil war. Conflict on all levels - personal, interpersonal, and societal - is a central theme. The resolution of these conflicts makes for compelling reading and creates an underlying current of stress throughout the book. I have been unable to let go of the Twilight Zone like ending that simply blew me away. Achter de prachtige cover van De parade schuilt een verrassend goed verhaal vol humor, maar tegelijkertijd mededogen. Een verhaal over de huidige maatschappij, over oorlog en uitersten. Twee mannen - Vier en Negen - die in niets op elkaar lijken, hebben de taak een nieuwe weg aan te leggen in een naamloos land. Maar kunnen zij als buitenstaanders ooit de nasleep van de oorlog in dit land begrijpen? Hoewel het einde behoorlijk voorspelbaar was, was ik toch onder de indruk. Het is interessant om t Achter de prachtige cover van De parade schuilt een verrassend goed verhaal vol humor, maar tegelijkertijd mededogen. Een verhaal over de huidige maatschappij, over oorlog en uitersten. Twee mannen - Vier en Negen - die in niets op elkaar lijken, hebben de taak een nieuwe weg aan te leggen in een naamloos land. Maar kunnen zij als buitenstaanders ooit de nasleep van de oorlog in dit land begrijpen? Hoewel het einde behoorlijk voorspelbaar was, was ik toch onder de indruk. 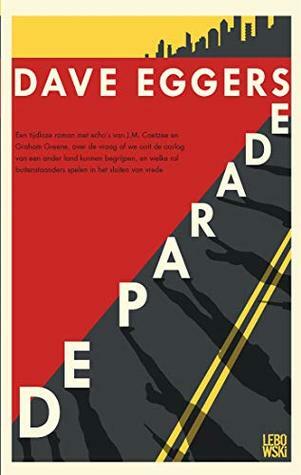 Het is interessant om te zien hoe Dave Eggers zo’n sterk verhaal in zo weinig woorden weet te vertellen. Kort maar krachtig. (En een miljoen maal beter dan De cirkel. An enjoyable, strange satire, which is about as fresh and far removed from most American literature as you are likely to find. The Parade follows the construction of a long straight road connecting the north and south of a middle eastern country recently ravaged by civil war. The two workers building this road are western, employees of a large, wealthy company, and are known to each other only by numbers they have assigned themselves. Four and Nine, as they are called, are polar opposites; one a f An enjoyable, strange satire, which is about as fresh and far removed from most American literature as you are likely to find. Four and Nine, as they are called, are polar opposites; one a focused, driven company man; the other a libertine, more interested in the local hospitality than the job at hand. The tension between the two thinly-sketched characters works nicely as they wind their way through this ruined country. A huge parade has been promised at their endpoint, the Capital, and the pair must negotiate curious locals, smatterings of rebels and eachother if they are to make it in time. The whole book has a wonderful fable-like quality to it, though the ending is rushed and not entirely satisfactory. I’ve had a love/hate – or more accurately, like/dislike – relationship with Dave Eggers’ work since cracking A Heartbreaking Work of Staggering Genius nearly two decades ago. Like many I was hooked immediately by the author’s confidence, his seemingly effortless ability to craft poignant, if not allegorical, tales just about anyone can relate to. Eggers hasn’t always stuck to this approach, however. It was when he messed with the formula, muddied up his storytelling with self-righteousness, that I’ve had a love/hate – or more accurately, like/dislike – relationship with Dave Eggers’ work since cracking A Heartbreaking Work of Staggering Genius nearly two decades ago. Like many I was hooked immediately by the author’s confidence, his seemingly effortless ability to craft poignant, if not allegorical, tales just about anyone can relate to. Eggers hasn’t always stuck to this approach, however. It was when he messed with the formula, muddied up his storytelling with self-righteousness, that he’d lose me. Simply put, the simpler the story, the better. This is by no means foolproof; after all, one could hardly call Zeitoun “simple” and it’s one of my favorite books. I guess what this humble, loquacious reviewer is trying to say is that you never really know which Eggers you’re going to get. That is until you dive in and see for yourself, as the author typically plays his hand pretty early on. Such is the case with his latest work, The Parade. Eggers gets to the point pretty quickly; I knew what I was getting within the first few pages and then, like that… I had blown through the first hundred pages. So yes, The Parade falls into the “like” category, mostly because there isn’t much to it, story-wise. It’s this simplicity that allows it resonate, provoke thought. Eggers tells the story of two men, hired contractors who go by the pseudonyms Four and Nine. They’ve been brought to a country recovering from several years of civil unrest to build a road that would act as a direct pathway to the country’s capital. Four is reliable, known as “the Clock” for his timeliness; Nine, with his proclivity for drink and debauchery, is Four’s polar opposite. Their relationship is unsurprisingly – if not predictably – fractured, all but destined to fail. But The Parade is about so much more than just two opposites clashing. 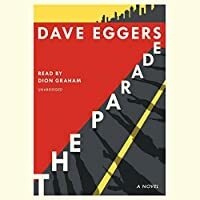 Eggers leaves it up to the reader to discover the novel’s deeper meaning(s); for me it was pitting hope versus despair, task versus temptation, even right versus wrong. I imagine it’ll be different for others; some may even find it boring or pointless. So be it. As I’ve said many times, Dave Eggers isn’t for everybody. Not my favorite Eggers book. Four was my favorite character but I did feel bad for Nine at times. I know Nine meant well with wanting to eat with the locals and communicate with them but in a way I feel like this contributed to the sad ending. I love Eggers’ writing style but this book although short was hard to read at times. Thanks to Penguin Random House/First to Read for the review copy. This short parable is the kind of read in which everyone will see something different. Some will see at as cynical, some hopeful, still others will see it just as a waste of time. I liked it. Eggers is always interesting and progress is always messy. If you read Dave Eggers you know his style. Mostly it is from the point of one person inner dialogue that always seems to suffer from some form of neuroses. That has not changed and you know i enjoy it. He makes it work. This can be hardly be called a book, really it is a short story with a twist ending. It will hold me over till his next proper novel. Maybe that is the attraction. His work shows a deep commitment to what he’s trying to express and he draws you in to follow his stru Dave Eggers is an enigma. This is the fifth book of his that I have tackled and I’m never sure exactly why I have undertaken it. Not that he’s not a fine writer. He is. But he’s all over the lot. His subject matter ranges from the reaction to the current state of society, as in Zeitoun and The Circle, to fever dreams like Hologram for the King and What is the What. I won’t give away the rationale of the story except to say that there is one and I felt it was well developed and relevant to today’s culture. As I write this I realize that Parade reminded me a little of Beckett and some of the Absurdist Theatre pieces of the Sixties. Even fifty years later, they still have something to say to us. Two foreign contractors are hired to build a road in a third world country. One is free spirited, the other is straight laced and serious. Each learn lessons of their ways. I did not expect to enjoy it as much as I did. I mean it’s so thin! How could a book so thin have an amazing story inside??? I was wrong. It was a great read! it was boring, i didnt like the characters and barely anything happening pretty much until the end. And them come on seriously THIS END ? Are you kidding ? I won’t spoil anything but for those of you who read it i mean seriously ? I understand where Eggers was trying to get with that but since this whole book was a drag to read for me i really didnt appreciate this end whatsoever. The only reason it gets two stars is because i didn’t stop mid-way. I don’t even know how i made it to the end. An urgently modern fable, with lashings of Beckett and Kafka, an undercurrent of Kadare and a fistful of, well, Eggers. Early contender for book of the year, from me. Read in one sitting. Ditto Ron Charles’s review, especially what he says about the ending. I mean, huh? Still, the story had me until then. Wait... what the f' was this all about!!!??? Enzo Pérès-Labourdette Yeah, I'm totally skipping Dave Eggers books after a hologram for the king! Enzo Pérès-Labourdette I feel the same! Although I did really enjoy What is the What! A pretty good short story that's being touted/marketed as a masterpiece novella. Eggers' writing was enjoyable and thought-provoking as always, but this particular narrative occupied an uneasy and (for me) unconvincing space between character study and dark 21st-century fable. Plus the end seemed both cynical and gimmicky. This character driven short work is about two contractors, 4 and 9, who must complete a road to the capital of an unknown, war torn country, in time for a planned parade. 4 is focused on the task at hand and follows the rules, 9 is responsible for clearing all obstacles, yet seems to be the biggest one with his wild ways. I've read many Dave Eggers books, and was moderately disappointed in this one until I finished it. Wow what an ending. While it's not my favorite of his I would still definitely This character driven short work is about two contractors, 4 and 9, who must complete a road to the capital of an unknown, war torn country, in time for a planned parade. While it's not my favorite of his I would still definitely recommend.